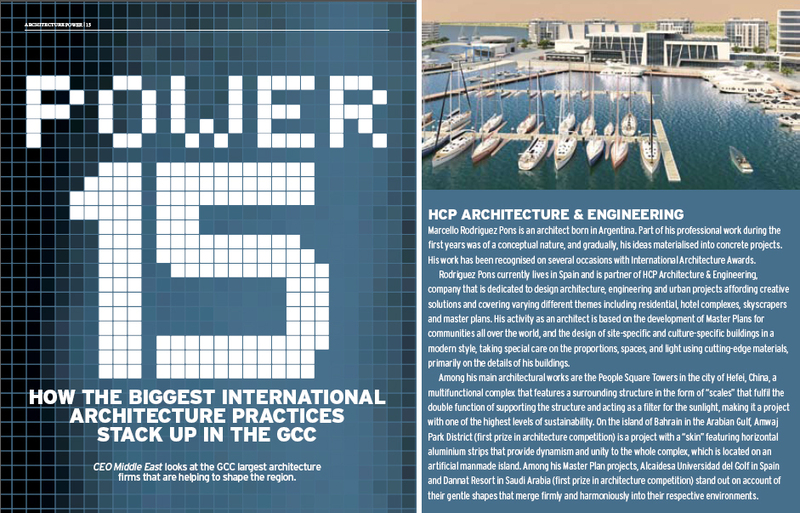 CEO Middle East Magazine, Dubai, named HCP with this distinction. Project director Marcello Rodriguez Pons, explains in the article which his thoughts are in the architectural fields and practise. As project director at HCP Architecture and Engineering he designed the People Square Towers in the city of Hefei, China, a multifunctional complex that features a surrounding structure in the form of “scales” that fulfil the double function of supporting the structure and acting as a filter for the sunlight, making it a project with one of the highest levels of sustainability. On the island of Bahrain in the Persian Gulf, Amwaj Park District is a project with a “skin” featuring horizontal aluminium strips that provide dynamism and unity to the whole complex, which is located on an artificial manmade island. Among his Master Plan projects, Alcaidesa Universidad del Golf in Spain and Dannat Resort in Khobar, Saudi Arabia stand out on account of their gentle shapes that merge firmly and harmoniously into their respective environments.